The version of Rails we’re using in this application is 3.1 Release Candidate 1 which had just been announced at the time of writing. You can upgrade by running gem install rails --pre. We can also remove any use of the var keyword as this is un-needed and at the end of a function we don’t need the return keyword. The final value in a function will automatically be returned, just like it is in Ruby. Semicolons are also unnecessary in CoffeeScript and can be removed too. Any function calls that pass in arguments don’t need to have the arguments wrapped in parentheses so we can remove those. The exception to this is when a function with no arguments is called. Parentheses are necessary here in order for CoffeeScript to know that a function is being called. Finally we have to change the way a function is called. We need to remove the function keyword and replace it with -> after the function’s arguments. This takes a little getting used to but it’s a concise way to define functions in CoffeeScript. We can follow similar steps to convert this code and end up with this CoffeeScript. Again we’ve removed the curly brackets and the semicolons. We’ve also removed the var and return keywords and replaced function with ->. We’ve also made some other changes to clean the code up. Anywhere we see a reference to this we can replace it with the @ sign so this.cleanNumber becomes @number. We can remove the outer brackets from the if statement as they aren’t required. The ternary operator has changed too and we can replace the C-like question mark and colon with a if then else statement, adding the if at the start, replacing the question mark with then and the colon with else. For a sequence of numbers we can use a range instead of an array. If we want our loop to count down rather than up we just need to reverse the numbers in the range. This is similar to what the for loop in our code does so we can replace it with a similar count down. Just as before we’ve removed the curly brackets and semicolons, replaced function with -> and references to this with @. 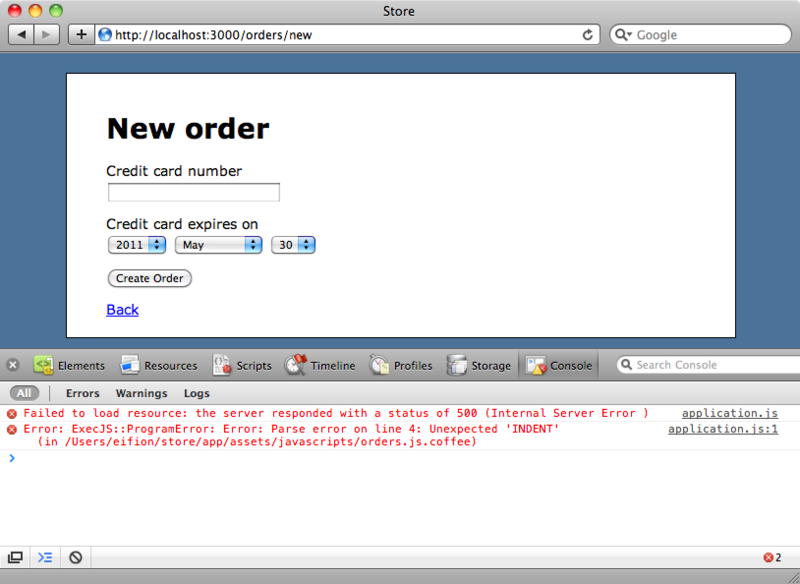 There’s one more change we’ve made which is to change the first call to $ to jQuery. This has no effect on the functionality but it makes it more obvious that we’re using jQuery here. There’s enough information in the error message to tell us what went wrong and on what line of the code so we know where to start debugging the code. That’s it for this episode. There’s a lot about CoffeeScript that we’ve not covered and it’s well worth taking a look at the CoffeeScript site to learn more about this fun little language.